1) Neffinger and Kohut are seasoned professionals who have coached dozens of nationally-known politicians, businessmen, military leaders and speakers. When they dispense a tip — like “hold the imaginary ball when you’re speaking” — it’s a proven tip that insiders at the top of their game use. I felt like I was getting their probably very expensive one-on-one coaching at a huge discount. 2) The authors draw upon the scientific literature to back up their points – no speculation here. Anecdotes are nice, but when someone cites the hard science of how and why something works, it becomes even more convincing for me. For example, I really appreciated their explanation that strength feeds off the hormone testosterone while warmth is mediated by oxytocin, and that these two hormone systems inhibit one another. So if you sometimes feel as if there’s a physical conflict between displaying strength vs. warmth, it’s because there is. 3) They’ve organized the book such that it’s easy to follow and implement their tips. They start by explaining what they mean by strength and warmth, and how you’re broadcasting them via your gender, age and appearance. Then they teach you how to convey strength and warmth more effectively depending on the context and what you’d like to accomplish. 4) They illustrate their points with real-world stories – Gandhi, Martin Luther King, Hillary Clinton in the 2008 elections, US Presidents — that bring the teachings to life, making them easier to implement. For a shot of strength before going into a big meeting, stand “big” for a couple of minutes, taking up a lot of space. This reduces cortisol and increases testosterone. Gender matters. There is a subtle art to women projecting strength and men projecting warmth without alienating their audiences. The five gestures that researchers have found to reduce warmth: leaning away; crossing arms; touching, rubbing or grasping hands together; and touching the face, stomach, or other parts of the body. Stop doing them! The flinty-eyed smile (think Clint Eastwood), or “strong smile”, is a great way to project both strength and warmth. When giving a talk, replace filler like `um’ and `uh’ with silence. So much more powerful. First connect, THEN lead. Once you “step inside their circle”, you have much more persuasive power. In short, these are essential life skills that no one had bothered to teach us up to now. I hear the book is already mandatory reading at Harvard Business School; it should be required reading for all high schoolers. 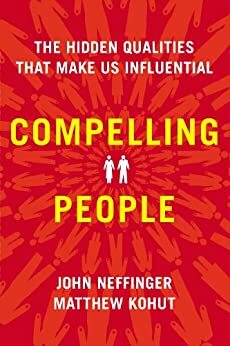 If you’re a person at all interested in being more effective in your interactions with other humans in the realm of work, politics, romance, family life and more, then you should be reading this, too. Compelling People entertains and instructs in a way that can directly lead to your being a better version of yourself.